With Republican control of the high court hanging in the balance, conservative lawmakers rushed the so-called retention election bill into passage last session in time for the re-election bid of sitting justice Robert Edmunds, the only member of the court whose term is expiring. Critics of the new law say that it effectively takes choice away from voters and does not constitute an “election” as that term has been historically construed in North Carolina, making it a change that requires a voter-approved constitutional amendment. A three-judge panel agreed in February, striking down the law as unconstitutional just days after argument and prompting the state Board of Elections to open up the Supreme Court filing period for challengers and set down a June 7 primary date, if necessary. The Supreme Court has taken the appeal of that ruling on an expedited basis, with a decision expected sometime before the primary date. Justice Edmunds has recused himself from participating in the case. Two challengers to Edmunds have emerged – Sabra Faires, the Raleigh attorney who is one of the plaintiffs in the pending lawsuit, and Wake County Superior Court Judge Mike Morgan. In papers filed with the court, Faires contends that the retention process is more akin to a referendum than the constitutionally-required election, a position supported in friend-of-the-court briefs submitted by the American Civil Liberties Union of North Carolina as well as University of North Carolina School of Law professor and legal historian John V. Orth. ““Election” as defined by history, context, and unbroken practice means an election in which there is the possibility of opposing candidates, and does not mean an election in which only one candidate is presented to the qualified voters of the State,” Orth wrote. Anything departing from that traditional “election” process requires a constitutional amendment, Faires adds. Each of the other nineteen states that use retention voting for some or all judges have state constitutions expressly providing for such elections. Faires also warns that should the court find that a retention vote satisfies the constitution’s “election” requirement, such a process could also be used for other offices as well – governor, for example, or attorney general. If the up-or-down vote for justice does constitute an “election,” state lawmakers still violated the constitution by adding an additional qualification for the office – namely, that a candidate must be a sitting justice. 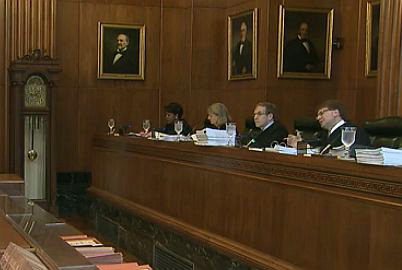 In response, the Board of Elections says that Faires lacks standing to challenge the law because she has no constitutional right to run for the Supreme Court and contends that the new law does not add a new qualification for that slot – noting that candidates in the open election that would follow if the incumbent loses in the retention cycle would not have to be sitting justices. The board also argues that the new process does not take choice away from voters, noting that the law only applies to incumbent justices seeking to retain the seat they won in a previously-contested election. Support for retention voting as a solution to increasingly politicized judicial elections has existed on both sides of the legislative aisle for years, and the parties in this case don’t necessarily object to that concept. This case is not about the merits of switching from elections to retention votes. Nor do plaintiffs argue that election is the best method of choosing judges. In 1868, however, the people of North Carolina decided to make election of judges part of the fundamental law of the state, and that decision may be altered only by a constitutional amendment. The General Assembly usurped the power of the people in 2015 by enacting Session Law 2015-6 without the required three-fifths majority in each house and without a statewide referendum. As pointed out in the challengers’ court filings, more than 30 bills calling for a switch from contested elections to a retention model (or other form of merit selection) have been introduced in the General Assembly over the past 50 years, and nearly all recognized the need for a constitutional amendment to effect that change. That recognition for a constitutional amendment persisted in debate on the bill last session. In fact, according to the conservative Carolina Journal, House Speaker Pro Tem Paul “Skip” Stam challenged the proposed process of switching to retention voting in a memo circulated among his colleagues, in which he made the same arguments that Faires makes in her lawsuit – namely, that retention was tantamount to a referendum that required a voter-approved amendment to the state constitution. Argument is set for 9:30 this morning at the Supreme Court, 2 East Morgan Street, Raleigh.